The Unclimbable Ladder is a two player game where the challenge is climb the suspended rope ladder to the top and ring the bell without falling off on to the soft inflatable below and before your opponent manages it. If you fall off you must return to the start and try again. We normally allow three attempts in each game. You'll need patience, gentle movement, and a sense of balance to succeed. It's doable but only just! 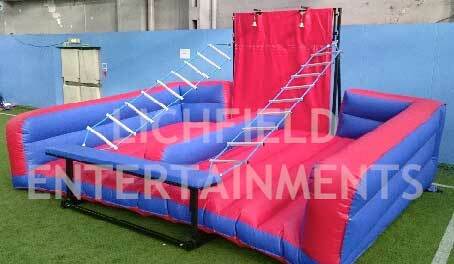 The Unclimbable Ladder is great two player game that's an ideal attraction for fun days and team building events. A friendly member of our staff is provided to supervise the use of the game which is suitable for use by ages 7 - adult. It needs an overall operating space of at least 18x18ft. 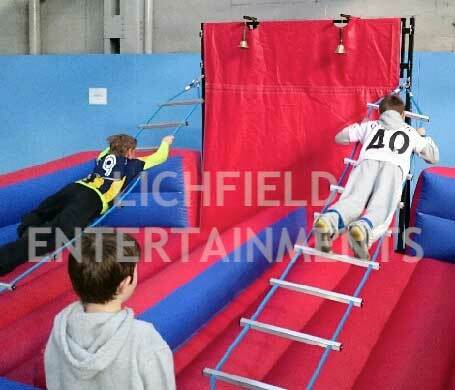 If you have any queries, questions or would like to book the Unclimbable Ladder, for your event then please click here to enquire and we will do all we can to help.